Shiraz Viognier by Wolf Blass of Adelaide Hills. These characters move onto the palate, joined by boysenberry, white pepper and ripe black fruits, interwoven by ribbons of cassis, violet and exotic spice. Gold Label is an ever evolving proposition, as emergent and resurgent genres in wine serve to enthuse the impassioned team at the House of Blass. Shiraz is sourced entirely from low yielding vineyards in the Adelaide Hills. A medium bodied Shiraz in sultry French styling, velvety textured, stately tannins and extreme length. Wolf Blass AM was born in East Germany in September 1934. After studying and working in the European wine industry for 13 years he migrated to the Barossa Valley, South Australia in 1961 with 100 pounds in his pocket, and the belief that he could "probably add something" to the Australian wine industry. Wolf's first job after arriving in Australia was as Sparkling Wines Manager for Kaiser Stuhl in the Barossa Valley. He also worked as a freelance technical adviser for independent producers. In 1966 Wolf registered the business name Bilyara, the aboriginal word meaning Eaglehawk. Wolf produced his first vintage of 250 dozen in the same year. Through 1969 to 1973 Wolf worked as Manager and Winemaker for Tolleys where he made his first significant impact on the local wine industry with development of red wine styles. He was considered one of the leaders of the new generation of Australian winemakers, creating individual wines of various styles under his own label. Under the guidance of Chief Winemaker Chris Hatcher, the steady hand of veteran John Glaetzer and the contemporary influences of Wendy Stuckey, Caroline Dunn and Kirsten Glaetzer, the award total for Wolf Blass now stands at over 3,000 awards at international and Australian wine shows and includes an unprecedented fourth Jimmy Watson Trophy for the 1998 Black Label at the 1999 Royal Melbourne Wine Show. In 2001 The International Wine and Spirit Competition recognised the achievements of Wolf Blass, with an award for the Best Australian Wine Producer. In 2001, Wolf was appointed as a Member in the Order of Australia for "service to the development of the Australian Wine Industry and to the promotion of excellence in winemaking, viticulture, marketing and research." In 2006, Wolf was awarded the Cross of the Order of Merit (Das Bundesverdienstkreuz) by the Federal Republic of Germany (one of the German government's most prestigious honours) for "nurturing positive relationships and partnerships between the German and Australian peoples, cultures and countries." 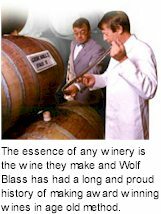 Wolf Blass AM is currently the Ambassador for Wolf Blass Wines International, participating in promotions, overseas development and maintaining the quality style of the winemaking production. As they have for almost 30 years, Wolf Blass wines continue to delight wine lovers all over the world.